The meeting comes a few days after the fifth anniversary of the arrest of Ilgar Mammadov, one of the country’s most prominent opposition figures and outspoken critics. He remains behind bars despite the European Court of Human Rights decisions ruling his detention illegal. Dozens of other activists and journalists have also been jailed in recent years, and draconian laws make the work of independent civil society nearly impossible. And yet the EU acts like it’s business as usual. This week the European Investment Bank (EIB) approved a €1.5 billion loan for the construction of the Trans Adriatic Pipeline (TAP), of which Azerbaijan’s state-owned company SOCAR is a 20 percent partner. TAP is part of the Southern Gas Corridor, which would bring Caspian Sea natural gas to Europe. That decision could pave the way for EIB support to another section of the Southern Gas Corridor that would connect TAP through to Azerbaijan’s shores. The EIB didn’t seem to mind that Azerbaijan’s anti-corruption activists and those monitoring Azerbaijan’s extractive industries have been among those persecuted. The EIB is the EU’s bank, so the EIB’s decision should have been made in compliance with the EU’s stated foreign policy principles on promoting democracy and human rights. In reality the EU’s concerns about Azerbaijan’s crackdown have no consequences when gas is up for discussion. Mogherini also has yet to show Azerbaijan that its relentless crackdown against critics and dismissal of the European Court’s ruling on Mammadov could lead to serious political consequences. Brussels continues to negotiate a new political and economic partnership with Baku, without first insisting that Baku take at least some steps to stop the crackdown, for example by freeing Mammadov. The partnership might indeed lead to more engagement and dialogue, but that doesn’t give much hope for activists unjustly behind bars or forced into exile. Azerbaijan just announced a snap presidential election in April, a surprise move likely to lead to a further clampdown on critics. 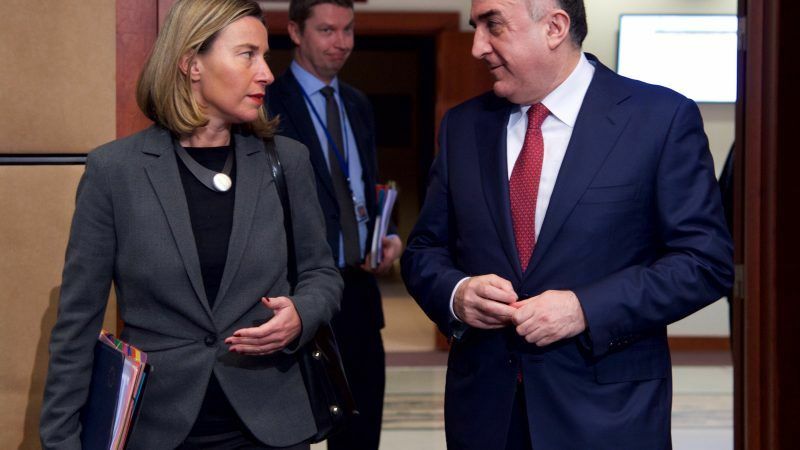 It’s urgent that Mogherini tell Mammadyarov that Azerbaijan’s failure to release those unjustly imprisoned and end restrictions on civil society jeopardizes any new partnership deal, as well as the EU’s support for a pipeline that is already tainted by repression. After the meeting Radio Free Europe reported that the European Union is urging Azerbaijan to implement reforms in the fields of elections, freedom of assembly, and the media ahead of the country’s presidential election in April. EU foreign-policy chief Federica Mogherini said that “the European Union has always stressed, as we did it again, that the full implementation of international obligations and commitments by Azerbaijan is vital to us.” Sources in Brussels told RFE/RL that EU officials raised a number of individual human rights cases, including that of opposition politician Ilqar Mammadov, who has been in prison in Azerbaijan since 2014. This entry was posted on	February 10, 2018 at 13:05	and is filed under EU, HRW, Human Rights Defenders.